Home > Articles > 644 > Are You Applying Enough Water for Vegetables Grown in High Tunnels? 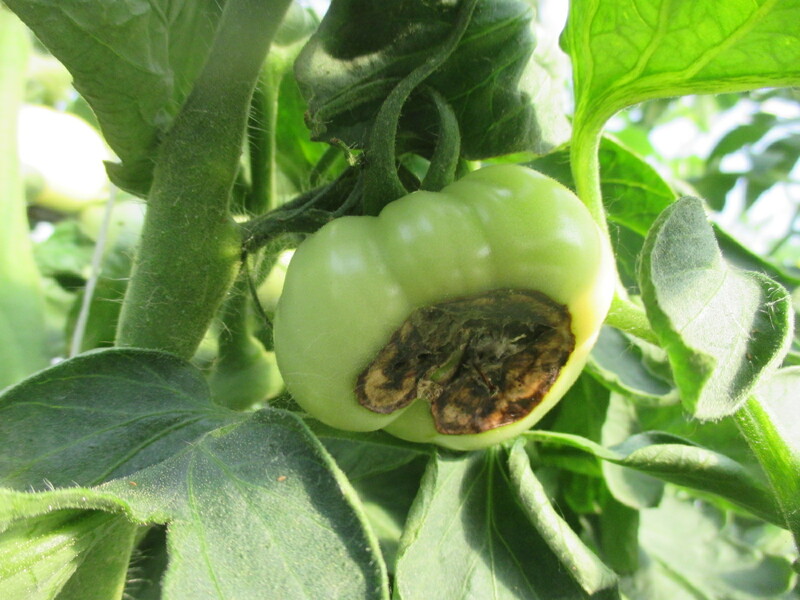 We recently received several calls reporting blossom end rot of tomatoes (Figure 1). Although blossom end rot is caused by deficient supply of calcium to the developing fruit. The occurrence of this physiological disorder often relates to inconsistent supply of water. Figure 1. Blossom end rot of tomato. As a general rule, vegetables require 1-1.5 acre-inches of water per week. Since there is no rain in high tunnels, all the required water should be applied through irrigation. How does one determine if enough water has been applied to vegetables? This article provides some ideas. The first information needed is the irrigated area. For example, tomatoes are growing in a 30 × 96 high tunnel with 6 beds that are about 4 feet wide. Then the irrigated area is about 2,304 square feet (6 × 4 × 96 = 2,304). An acre has 43,560 square feet. So the irrigated area is roughly 2,304 / 43,560 = 0.05 acre. The second step is to decide the amount of water plants need based on the general rule that vegetables require 1-1.5 acre-inches of water per week. 1 acre-inch of water equals to 27,154 gallons. Thus, to provide enough water for vegetables grown in an 0.05 acre area (the irrigated area in our hypothetical high tunnel), 1,358 – 2,036 gallons water should be applied each week, which is equal to 194-290 gallons water per day. It will be very handy if a water meter is installed in the irrigation system that can help determine whether enough water was applied on a daily basis. If there is no water meter, or if the irrigation system is controlled by the length of time it runs. We should know flow rate of the drip tube to be able to calculate how long the irrigation system should be operated. For example, if the drip tape has a flow rate of 0.45 gallons/minute/100 ft, which means every minute the drip tape can apply 0.45 gallons water per 100 ft. The total length of the drip tape covering 6 beds in the high tunnel is 576 ft (96 × 6 = 576). In this case, a total of 2.59 gallon water (576 ÷ 100 × 0.45 = 2.59) is applied to the high tunnel every minute. To apply 194-290 gallons water per day, the irrigation needs to run 75 – 112 minutes daily. Another question is how often water should be applied. Answers to this question would largely depend on soil texture. The sandier the soil, the less water it holds, and water should be applied more frequently. In our high tunnel at the Southwest Purdue Ag Center that has sandy soil, we apply water 3-4 times in a day evenly divided between applications. For clay soils, it is possible to apply water less frequently. However, it is still necessary to apply water on a daily basis.